Several poster sessions have been arranged within the Residual Stress Summit to widen the scope of the meeting beyond the specific subjects addressed by the invited oral presenters, and also to enhance the opportunity for up-to-the-minute technical information interchange. Voluntary poster presentations are solicited for display at the Residual Stress Summit. Participants who wish to submit a poster or demonstration are asked to submit a one-page abstract in 12-point Times New Roman font containing the name(s) of the author(s), their affiliation and contact information, the poster/demo title, and an abstract. Submissions will be accepted up to September 20, 2017, subject to space availability. To submit a poster, please contact Gary Schajer. The lunch period on the first day has deliberately been lengthened to provide an extended period where posters can be viewed in a relaxed atmosphere. The four coffee breaks during the Summit have similarly been lengthened. Poster presenters are expected to be "on-duty" during the first lunch period, and as much as is practicable during the coffee breaks. The maximum available space for posters is 48 inches (120cm) high x 72 inches (180cm) wide. In support of the practical theme of the RS Summit, residual stress measurement equipment will be displayed and demonstrated during the poster sessions. This is a popular and attractive feature of the Residual Stress Summits. 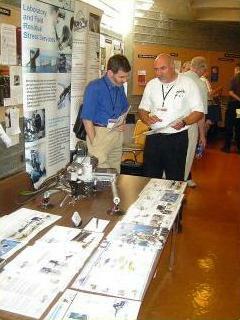 If you would like to display and demonstrate some equipment at the RS Summit, please contact Gary Schajer. Equipment demonstrations and displays will take place concurrently with the poster presentations. Demonstrations can include: displays from companies who provide services, resources and/or instruments for residual stress measurement, individuals/companies providing a real-time experiment demonstration, etc. Demonstrations will be provided with a 30 inches (75cm) wide x 72 inches (180cm) long table and one standard (110V/15A) electrical outlet. If requested, a poster board "backdrop" 48 inches (120cm) high x 72 inches (180cm) wide can also be furnished. Submissions for the Residual Stress Summit proceedings can be in any appropriate format, and may be submitted either as a MS Word (.doc) or .pdf file. Submissions can be viewgraphs or written manuscripts. These may be “lightly” reviewed for grammar/usage, but otherwise will be accepted “as-is”. The submissions will be distributed to all attendees in .pdf format via CD. The proceedings CD will also be available for purchase from the Society for Experimental Mechanics.